Children want to participate in every activity that adults do, including summer picnics. But until they are old enough to sit at a regular sized picnic table they are often relegated to a seat on the ground or small fold-out table. Until now! 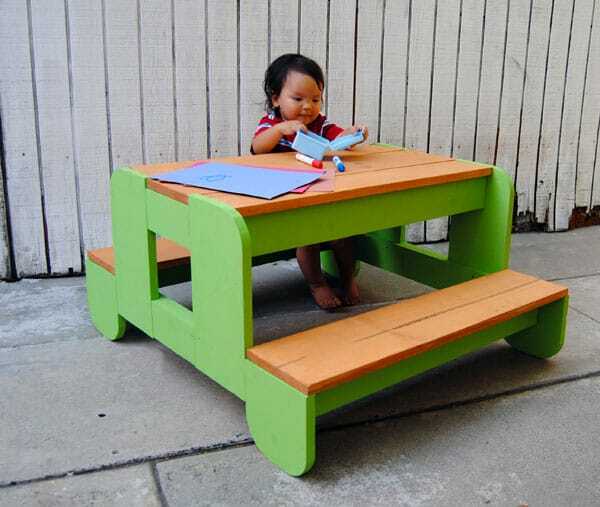 You can build this kids picnic table that is perfectly sized for your little ones to use for eating lunch, snacks or doing activities. There are no chairs to hassle with or tip over and no tables to setup. 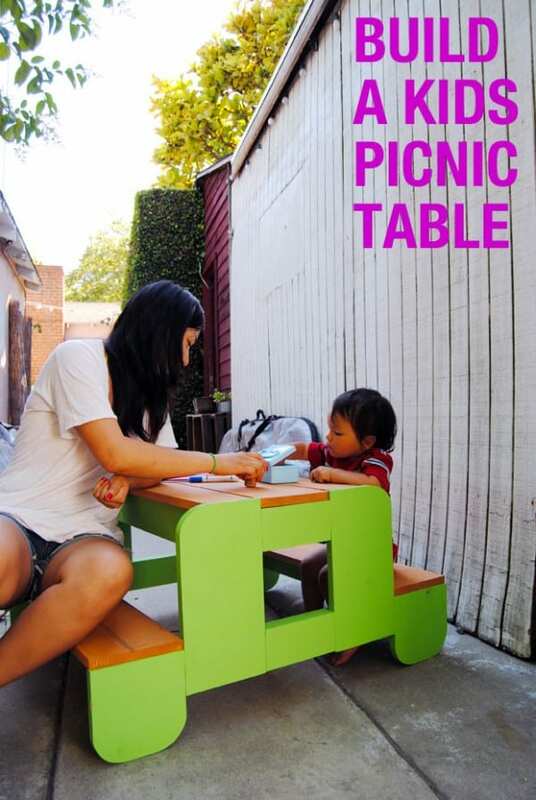 This picnic table is one piece and is small enough to be moved by one person and will easily fit into the back of a pickup truck but you’ll probably leave it at home so your kids can enjoy summer mealtimes as much as you. 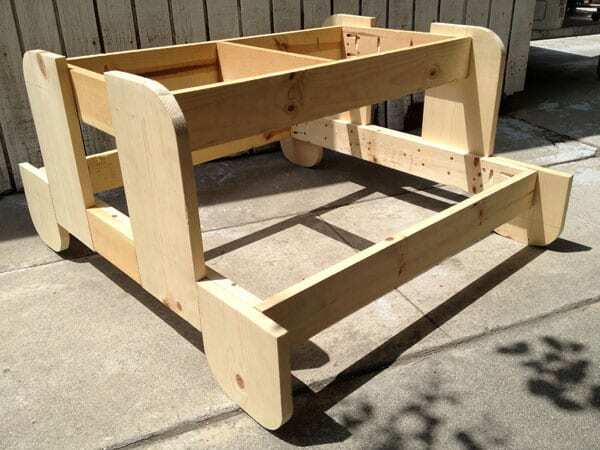 We were inspired to build our kids picnic table by this project from Lowe’s Creative Ideas. This is an amazing magazine that never fails to impress us with beautiful projects each month. It’s free so you can’t be that! We loved the size of this picnic table but we did to alter the plans slightly and trim two of the 8″ end table top boards to 6.5″ so they wouldn’t extend past the rounded ends. Our local Lowe’s didn’t have any cedar in inventory so we went with white pine which was cheaper but a much softer wood. We’d recommend using redwood or cedar for this project. Download the lumber cut list and detailed plan instructions here. 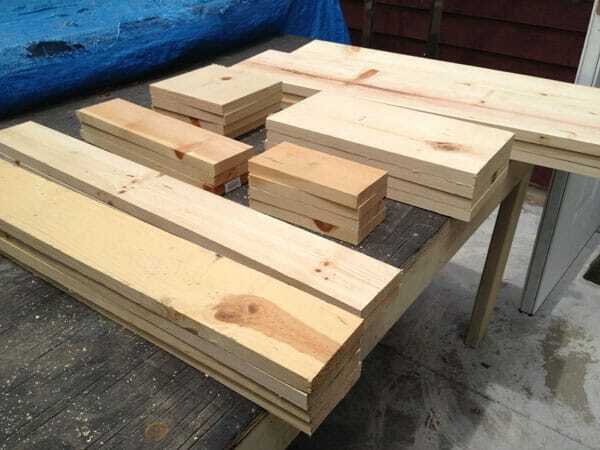 Cut the rails (A), seat stretchers (B), and top stretchers (C), from 1 x 4 cedar (Project Diagram, Cutting List). Mark the locations of the pocket holes on the parts, set your pocket-hole jig for 3/4-inch-thick material, and drill the holes (Project Diagram, Drawing 1). 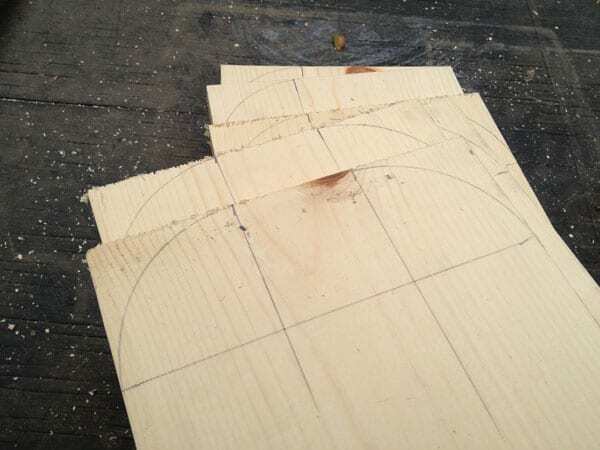 Cut the uprights (D) and legs (E) to length, and use a compass to mark the 2-1/2-inch radius (Project Diagram, Drawing 3) on the corners of the parts. 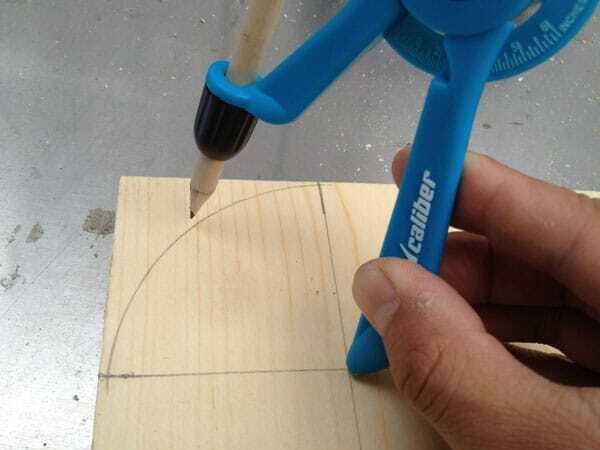 If you don’t have a compass, use a quart-size paint can to draw the arc on each corner of the board or a string and pencil. The slightly different dimension of the paint can from the 2-1/2-inch dimension will not affect the design of the table. 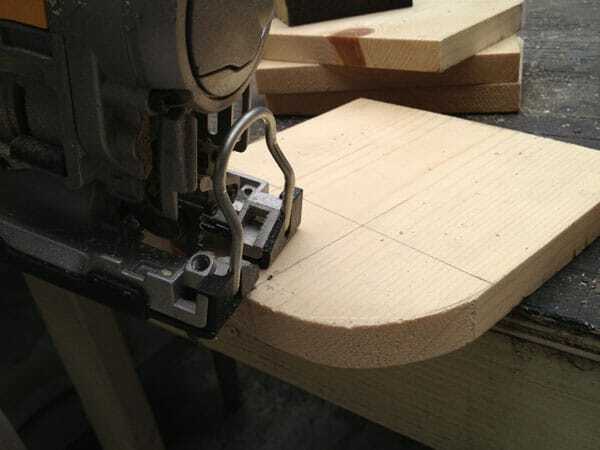 Clamp the parts one at a time to your work surface and cut the rounded corners with a jigsaw. Sand the cut edges smooth with 150-grit sandpaper. 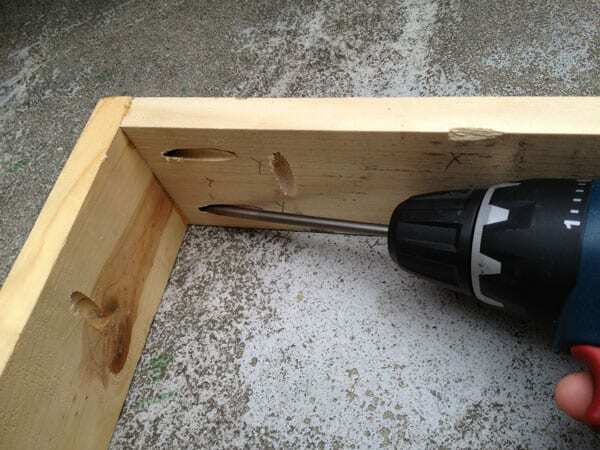 Using a pockethole jig, drill your pocket holes according to the plans. 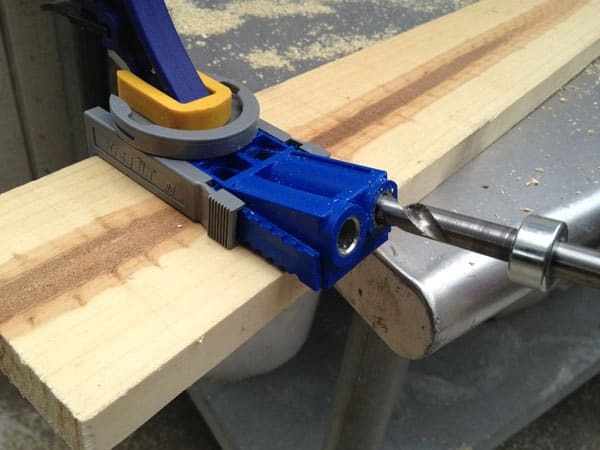 We love our Kreg jig! Mark the location of the uprights on the lower frame (Project Diagram, Drawing 3). 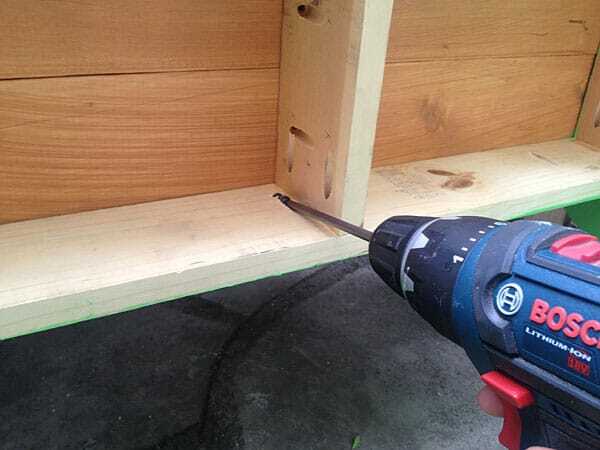 Glue and clamp the uprights to the frame and secure with screws driven through the rails into the uprights. Here are the top and bottom frames after they’ve been glued and screwed together. Flip the table upside down to add the upper frame between the uprights (Project Diagram, Drawing 4). 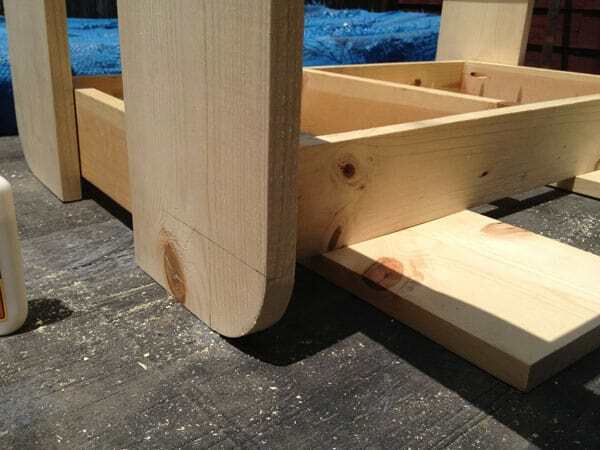 To position the upper frame below the top of the uprights by the thickness of the top boards, rest the upper assembly on a few scraps, add glue, and drive screws to secure the upper frame to the table. This will create the offset required for the top installation. Add the legs to the assembly even with the top surface of the lower frame. Secure with glue and screws. Cut the side spacers (F) to length and place the between the uprights. 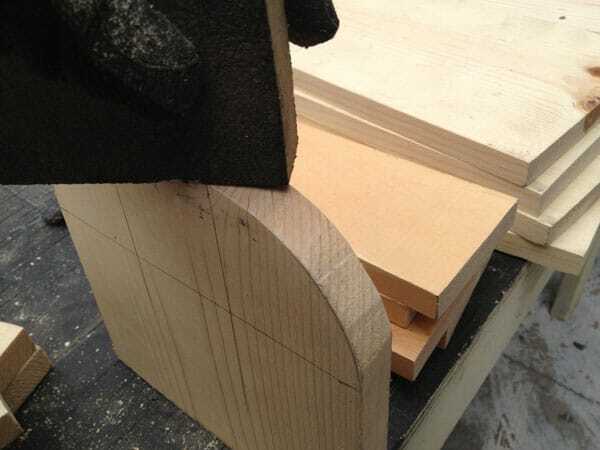 Because board thicknesses vary — they may not be exactly 3-1/2 inches long — cut these parts to the length that fits, sand, and install with glue and screws. 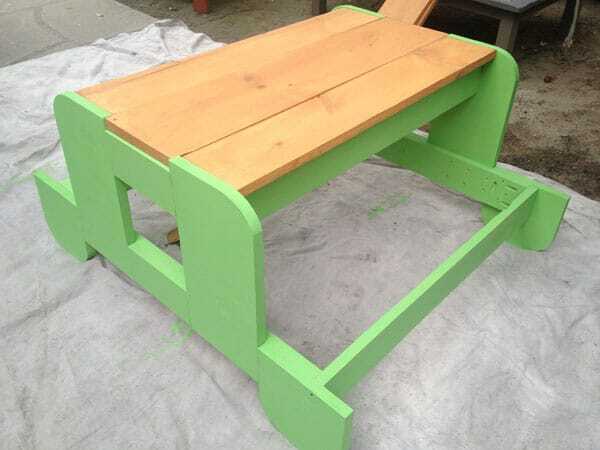 Flip the table over and cut to length the seat boards and center top slat (G), and the top slats (H). Sand the top boards and any remaining edges of the table and apply the finish. Apply a primer and two coats of exterior paint (Sea Exposure shown) to the table base assembly following the manufacturer’s instructions. 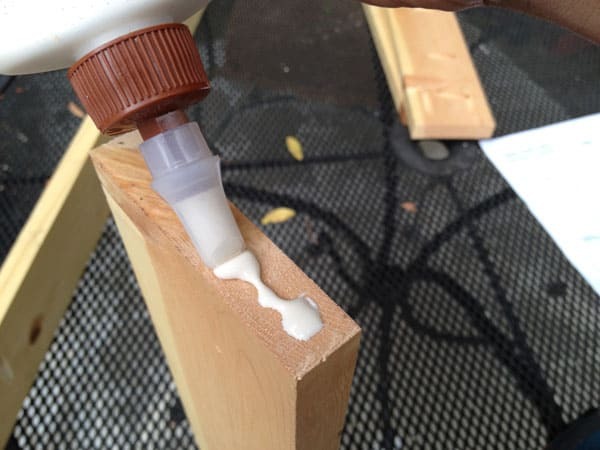 Apply a semi-transparent stain (Cedar shown) to the top and seat slats. 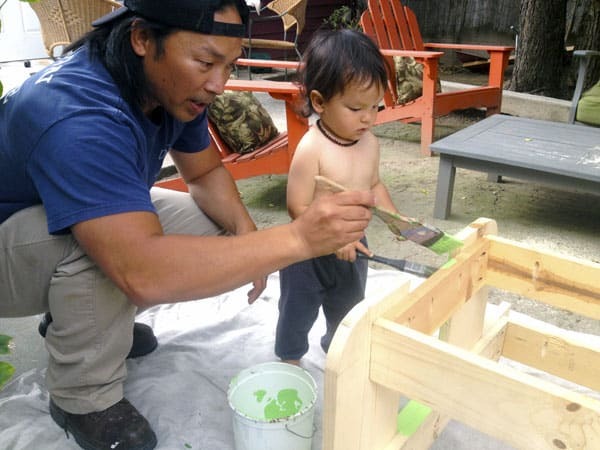 Our son loves to paint and he had a lot of fun helping us paint the base. Place the top and slats on a work surface and add the table base upside down. 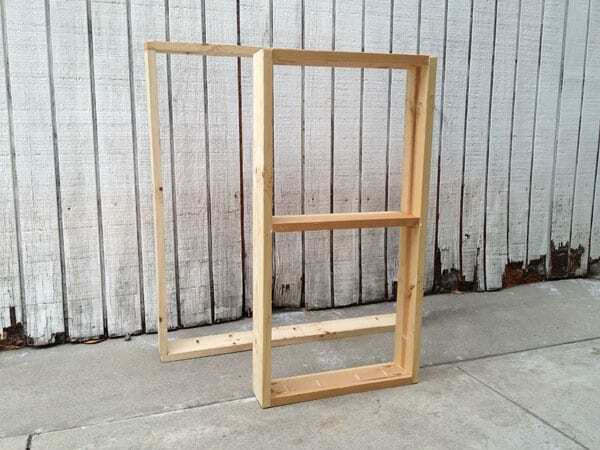 Use the pocket holes you drilled in the frame sides (A), lower ends (B), and upper rails (C) to drive screws into the top and seats (Project Diagram, Drawing 4). With pocket holes, the screws are invisible from above, and they won’t heat up in the sun on the surfaces of the board where small hands could burn on a hot day if the screws were exposed. Flip the table over let it dry overnight and then have fun! 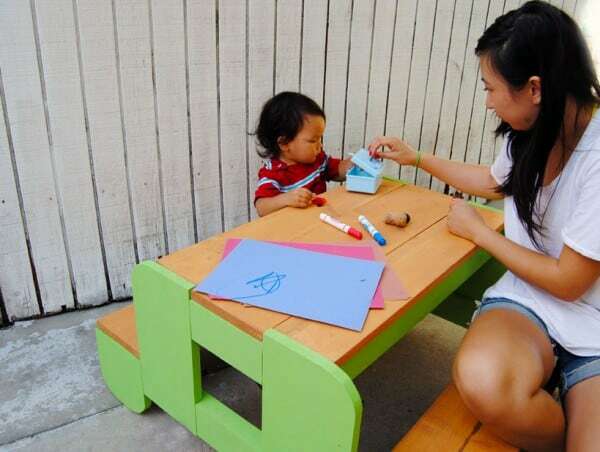 Our table is not only great for picnics but the perfect outdoor activity table that our son loves to use. Last year we built a full-size picnic table from a kit that we bought at Lowe’s. You can do the same and no tools are required. We did paint ours all white and we love it.